The Quality Hotel Grand Steinkjer is a modern conference hotel in the centre of Steinkjer. We have many different conference rooms that can be adapted to suit both smaller and larger functions. The hotel is a great base if you're planning to see more of Steinkjer's beautiful culture and scenery. In the summer you can go for a dip at the local bystrand beach, and in the winter there are miles of cross-country ski trails to explore. The Quality Hotel Grand Steinkjer is a full-service conference hotel with flexible meeting facilities that are ideal for all kinds of different events. Our large conference centre has seven meeting rooms, as well as group rooms, break areas and exhibiting spaces. Our dedicated and professional staff will help you arrange a great event for up to 350 people. 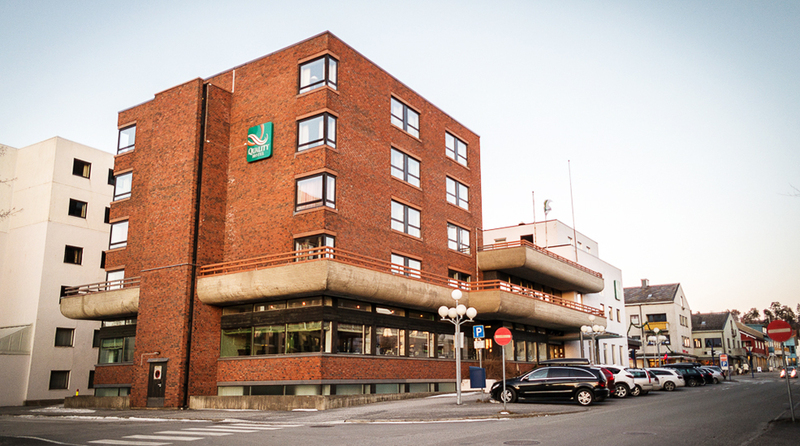 Quality Hotel Grand, Steinkjer is cash-free, providing added security for our guests and visitors. More information about this can be found under FAQs. After a demanding conference come and enjoy a good dinner in our restaurant, with its fresh and relaxed atmosphere. Here you can also arrange private functions such as weddings, confirmations, dinners and parties. You can sit back in our lobby bar with a coffee, glass of wine or delicious drink. Why not try our locally-brewed beer? Local train to Steinkjer station.